Floating offshore wind turbines could more than meet the electricity demands of the European Union, according to a new report (PDF) from the European Wind Energy Association, first reported by Business Green. In fact, offshore wind turbines could potentially supply over four times the electricity needs of the EU. The report maintains that floating wind turbines can be adapted to harsh North Sea conditions, and could be a vital part of Europe’s renewable energy infrastructure. It is asserted that floating wind turbines are cost-competitive with conventional offshore wind turbines when installed in deep water (over 50 meters). The report calculates that EU offshore wind capacity could hit 150 gigawatts by 2030, if the right renewable energy development policies are implemented. The EU currently has about 5 gigawatts of offshore wind capacity. Although 3.3 of the 5 gigawatts are located in UK waters, the UK and others oppose the adoption of new renewable energy targets. They contend that it would be more appropriate to set a significant emissions reduction target, that would let nations work out their own plans of how to meet the target – rather than force one particular technology and solution. 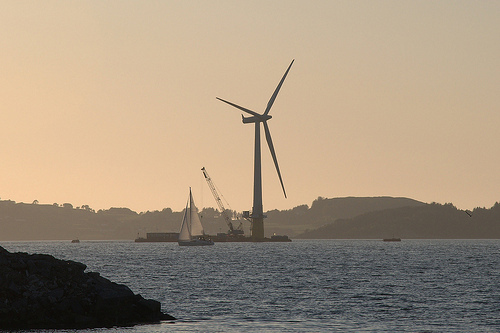 Image CC licensed by L.C.Nøttaasen: World’s first full-scale floating wind turbine.